1. Q – What is the difference between D'OXYVA & Circularity? A – Circularity (Circularity Healthcare, LLC) is the name of the company and D'OXYVA is the brand name of Circularity’s first product line. D'OXYVA stands for Deoxyhemoglobin Vasodilator, which are terms for which much greater detail can be easily found with an Internet search. 2. Q – Do we have any special financing for customers who can’t afford the device and cartridges but would like to purchase them? A – You might easily get a payment plan when checking out via PayPal Credit at www.doxyva.com. It is a very simple process and takes a minute to get verified and approved online. People who buy our products this way will not be required to pay for 6 months and will enjoy interest free payments if they do within the 6 months period. 3. Q – How does the moorVMS-LDF™ - Vascular Monitoring System work and what does it measure - oxygen content in the blood, or circulation? How does it do so? A – The moorVMS-LDF laser Doppler blood flow monitor is a high performance, medical grade module for clinic or laboratory. Use of DSP technology brings you a portable, lightweight module featuring uncompromised specifications and reliability at a breakthrough price. Laser Doppler has become a gold standard for dynamic microvascular blood flow assessments. 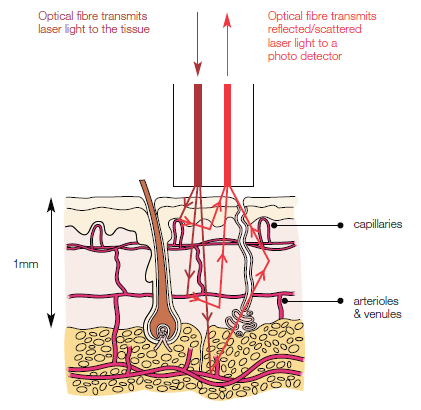 Optic probes are used to monitor blood flow in capillaries, venules and arterioles; vessels responsible for nutrition of the skin and thermoregulation. The sampling depth depends on probe design and tissue characteristics but is typically around 1mm. Source: > http://www.moor.co.uk. 4. Q – What does Vasamed®’s SensiLase® device measure - oxygen content in the blood, or circulation? How does it do so? 5. Q – Are there any clinical trials for D'OXYVA? 6. Q – Can I buy CO2 Cartridges from sporting goods stores or online elsewhere? A – The patent-pending special safety cartridges only fit the D'OXYVA device and are sold exclusively by Circularity. They are filled with purified CO2 to well over 90% purity, which is different from the tire inflators and soda water makers. The cartridge design includes a safety feature so they do not burst in extreme conditions, they just crack open on the side and release the contents. Cartridges not sold by Circularity often contain rust and other toxic trace elements inside them and that could be dangerous for your health if used with D'OXYVA. You should never try using other cartridge brands than Circularity as this may cause serious injury and may even result in death! 7. Q – Does D'OXYVA raise oxygen levels or CO2 levels in the blood? A – Both. It safely and rapidly dissolves CO2 in tissue transdermally (on the skin), which then readily reaches the tiniest vessels called capillaries in microcirculation. This process raises CO2 levels in tissue, which in turn is thought to raise CELLULAR OXYGEN levels when the CO2 interacts with the red blood cell’s hemoglobin protein. This process is called the oxygen curve shift, or more commonly the Bohr effect. 8. Q – If oxygen is off loaded from hemoglobin, what does this do to the quality of the hemoglobin and where does the hemoglobin get its oxygen back from? If hemoglobin can be depleted of oxygen, then what? 9. Q – If CO2 can be delivered transdermally into the body through water vapor, why doesn't it just come back out somewhere else? A – CO2 gets exchanged in the lungs, the blood and via the skin. The skin also emits CO2 in small amounts, but since the hemoglobin exchanges most CO2, it gets metabolized and any excess amount is exhaled via the mouth and nose. 10. Q – Why do you want increased CO2 levels in the blood? 11. Q – Could you explain the Haldane effect and why it is important? 12. Q – How can a CO2 solution held against a finger penetrate the skin's barrier and enter the blood stream? Why is your system different from using carbonated water from a soda stream? A – Some of the mechanisms of action is still confidential and until our clinical papers are published describing the highly effective transdermal delivery of CO2 and significant increase in microcirculation in capillaries in a select peer-reviewed journal, we typically provide sensitive information under a simple non-disclosure agreement (NDA). Our medical and scientific advisory board includes some of the foremost experts and medical thought leaders in podiatry, cardiovascular physiology, diabetic foot complications, endocrinology, neurology, exercise physiology, and vascular surgery with a combined publication of over 1,000 papers worldwide. They are providing more scientific detail privately and publicly. We use the term "carbon dioxide gas" for non-experts. However, CO2 absorbed via Transcutaneous means is not in the form of visible bubble but highly concentrated water-dissolved molecular CO2. If the skin is simply sprayed with just CO2 gas or soda water, carbon dioxide is not absorbed and medical effects cannot be obtained. The key is the high concentration level that no competitor can achieve as effectively as D'OXYVA today. It is difficult to dissolve carbon dioxide to reach a high concentration level without allowing the carbon dioxide to escape, making it inappropriate for medical use. D'OXYVA’s applications have about 50 times higher concentration levels than any competitor on the market with a much more efficient and affordable delivery system. The CO2 and H2O are loosely connected in the supersaturated wet gas produced by Circularity's technology. CO2 has weak acidity and tends to dissolve into water and oil easily and a part of it may react with water to generate "carbonic acid = H2CO3". The skin contains water and it is oily and these properties facilitate safe and quick dissolution. The lower the pH of the solution the more carbon dioxide exists in molecular state, which increases dissolution via the skin pores and glands and directly into the capillaries. If the pH of the solution is high, carbon dioxide in water changes to carbonic acid and bicarbonate ion that are hardly absorbed through the skin. Oxygen dissolves into water and somewhat in blood. This is called "physical dissolution". Only about 6.5 ml of oxygen dissolves into 1L of water at a water temperature of 20 degrees Celsius. The amount of dissolution of oxygen is low, only 1.5% is dissolved in the blood plasma. Therefore, you need excessive pressure in a chamber to "push" oxygen through the skin such as in Hyperbaric Oxygen Therapy. That is the reason most oxygen therapies are not so effective and some of these therapies are approved as high-risk Class III medical devices by the U.S. FDA and need 24-hour application. It is important to note that blood is supplied to all parts of the body at all times, but all capillary beds do not contain blood at all times. Blood is diverted to the parts of the body that need it most at a particular time. For instance, when you eat a meal blood is diverted from other parts of your body to the digestive tract to aid in digestion and nutrient absorption. You may find a more scientific explanation of CO2 absorption via the skin by reviewing the following paper created for a Japanese CO2 gel application. Again, they seemingly cannot achieve the required high concentration levels for a highly effective medical application like D'OXYVA. 13. Q – What is the difference between D'OXYVA and what happens in a hyperbaric chamber? A – Hyperbaric Chamber or Hyperbaric Oxygen Therapy (HBOT) works based on a different principle from D'OXYVA. With HBOT, the recipient of the therapy sits in a pressurized cabin filled with oxygen. The oxygen enters the body both through inhalation and transdermally (through the skin.) HBOT mimics exposure to high altitude by trying to infuse the oxygen into the body from the outside in the chamber. With D'OXYVA, CO2 is safely dissolved on the skin and it is thought to amplify the naturally occurring Bohr effect (cellular oxygenation) and blood vessel vasodilation. CO2 is responsible for blood auto-regulation in the body, and when levels are higher, it creates increased blood flow from the expansion of the vessels (vasodilation), which is thought to make vessels more elastic and healthier as opposed to rigid and calcified. D'OXYVA could not be administered in a chamber like HBOT, because direct inhalation of CO2 is very dangerous and could result in suffocation. 14. Q – What gets better results, D'OXYVA or a session in a hyperbaric chamber or negative wound pressure therapy? Why? A – We are not aware of any comparative clinical studies that show which one is more effective and while the two applications are hardly comparable, if you consider comparing separate studies from the two applications and consider that oxygen (O2) has a very low dissolution in the body (only 1.5% dissolves in the blood plasma), HBOT takes at least 1-2 hours at a time in a large chamber that has explosion hazards, then you could realize that D'OXYVA’s rapid 5-minute portable application shows much more promising efficacy, cost and time efficiency. Hyperbaric Oxygen Therapy (HBOT), often requires dozens of visits over a period of months to an enclosed, pressurized chamber for up to three times per week. Others, such as negative pressure wound therapy (NPWT) require the patient to be tethered to a heavy pump 24 hours per day, often for months on end. Both of these applications are akin to stifling a patient's freedom during the treatment, and often their overall condition and wound(s) do not heal, resulting in amputation. 15. Q – Where is the best place to apply the device and how many times? A – At this point, we do not have adequate clinical evidence to provide a definitive answer. However, we have learned from publicly available research that in general, the human palm of the hands and sole of the feet have about seven times more skin pores per square inch (about 3,000) than elsewhere on the body, which theoretically provides a higher CO2 absorption rate. In addition, during Circularity’s recently concluded clinical study the delivery was via the thumb and the tissue perfusion or microcirculation (Skin Perfusion Pressure) results were measured in the big toe. The results showed significant, hours of lasting blood flow increases after just one 5-minute delivery that may prove to be a promising tool in healing chronic and trauma wounds if applied as a regimen in certain doses. No claims are made until further studies are conducted with clearance by WIRB, the U.S. FDA and/or other regulatory body. Doses can be determined by the user after a month of use of at least one a day depending on progress. Circularity will make more information available once D'OXYVA concludes its dosing clinical study. In addition, based on more detailed understanding of the multiple mechanisms of action believed to take place with D'OXYVA's applications, especially based on the recent summary review by members of Circularity's scientific advisory board for D'OXYVA's clinical paper for peer-reviewed publication, we would also like to emphasize the importance and the potential improved benefits with local delivery on the body. In short, this scientific theory is about the understanding of how the body metabolizes various substances in the cardiovascular system, in this case CO2. After also applying D'OXYVA locally for various conditions such as varicose veins, pain, hair, scars and acne there seems to be a faster beneficial response when compared to applications just on the thumbs. People should also use D'OXYVA near or on any effected area, but never on open wounds as this would require additional regulatory scrutiny mainly from a policy point of view. For example, people with pain in their legs or back could apply half of the full 5-minute application on or near the site of the source of pain and the other half on both thumbs. 16. Q – Can pregnant and/or nursing women use the device? A – Typically, we try avoiding indicating use for pregnant or nursing women, although no risks or no adverse effects have been reported to Circularity as of today. 17. Q – Can people with malignant cancer use the device? The National Cancer Institute endorsed Dr. Warburg's findings in 1952. This research was continued by Dr. Harry Goldbatt, who published his findings in the Journal of Experimental Medicine in 1953. His research confirmed that lack of oxygen plays the major role in causing cells to become cancerous. Dr. Albert Wahl said, "Disease is due to a deficiency in the oxidation process of the body, leading to an accumulation of toxins. These toxins are ordinarily burned in normal oxidation". Dr. Wendell Hendricks of the Hendricks Research Foundation wrote: "Cancer is a condition within the body where the oxidation has become so depleted that the body cells have degenerated beyond control. The body is so overloaded with toxins that it sets up a tumor mass to harbor these poisons and remove them from general activity within the body. Dr. Hendricks further stated, "The true cause of allergy is a lowered oxidation process within the body, causing the body to be sensitive to substances entering. Only when the oxidative mechanism is restored to a higher state of efficiency can the sensitivity be eliminated." 18. Q – Does cardio exercise create the same increased micro-circulation that the D'OXYVA does? A – Not like this. Perhaps an athlete who does cardio all day for decades may stay healthy, but cardio does not provide benefits the way D'OXYVA’s applications do. Remember, we often achieved over 100% increase over hours in blood flow in clinical trials. No cardio exercise is known to do that, especially, in 5 minutes and without physical exertion. Do you have a question? Please contact us via email or phone and we will do our best to answer quickly.